" It’s very stereoscopic and colorful, and to tell you the truth, I thought it could be used for various types of entertainment, and I was very excited. " Jay Sakomoto, President of SHOCHIKU Co., Ltd. The compact and lightweight body. High brightness and high picture quality. Cost-effectiveness (low power consumption, compact and light weight body) helps to dramatically reduce the costs of large-scale projection. On a stage floating on an artificial lake, a dynamic performance combining Kabuki with cutting-edge technology took place. Panasonic has achieved one of the world’s largest water screen projections with its 16 flagship projectors. Aimed to celebrate Japanese culture and arts and raise global awareness for Kabuki, a “Japan Kabuki Festival” with Kabuki performances and related events, is being planned for May 2016 in Las Vegas. 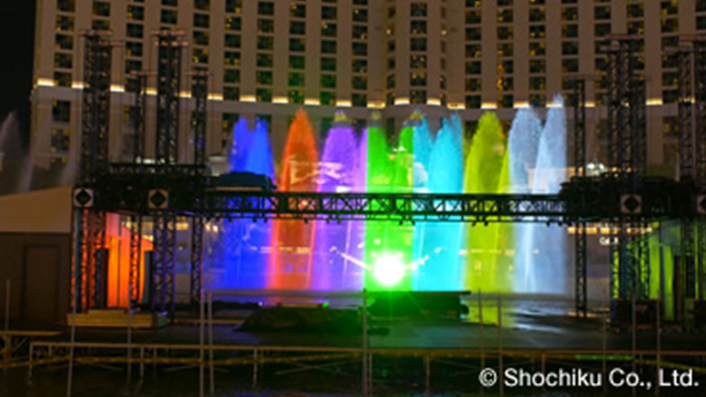 As part of the festival, “Panasonic Presents a Kabuki Spectacle at the Fountains of Bellagio” is the first in a series of projects to create a new entertainment form with elements of Kabuki. Along with Panasonic and Shochiku, a key collaborator was teamLab, which is esteemed worldwide for its digital tech artwork. In grand Vegas style, the event made accessible to a Las Vegas audience a traditional Japanese art form with a rich history spanning more than 400 years. 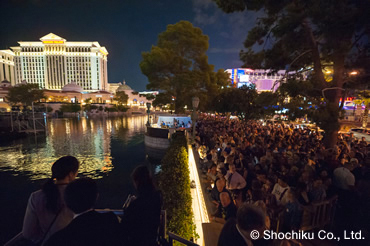 On a special stage that floated above the Bellagio Hotel's world-famous artificial lake, lead actors Ichikawa Somegoro and Nakamura Yonekichi delivered a stunning performance of “New Kabuki” - combining the Japanese traditional summer Kabuki title “Fight with a Carp” with fantastical modern digital art. The attraction features a total of 1,214 fountains that rocket streams of water 460 feet into the air to form a vast water screen. The Panasonic projectors displayed gigantic projections reaching a maximum of 18 m (59 feet) in height and about 300 m (984 feet) in width. 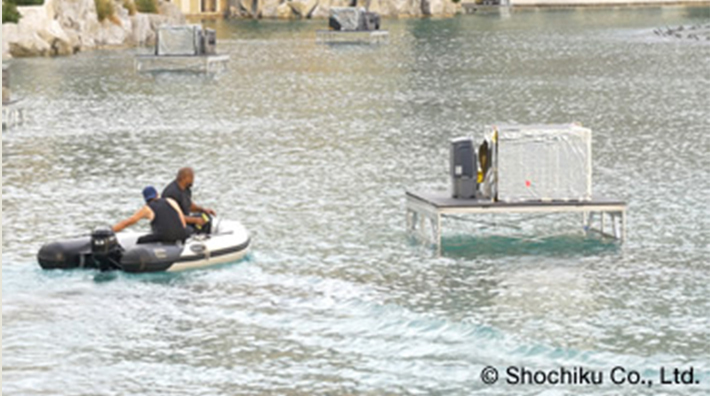 Because there was no space on the shore, most of the projectors were installed on scaffolds temporarily set up in the water. 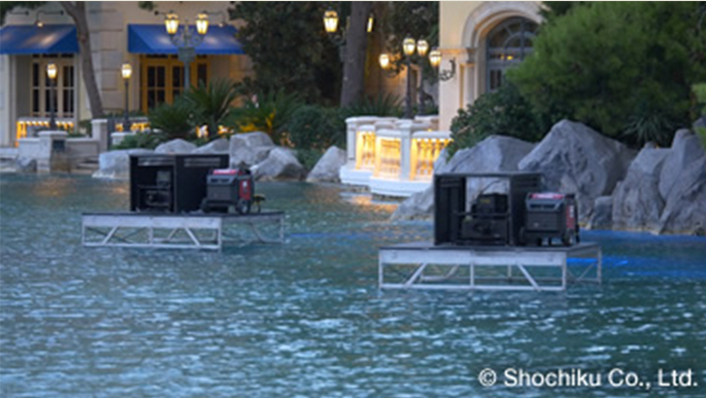 The PT-DZ21K projectors installed on the scaffolds temporarily set up in the water. Test patterns are projected on the water screen swaying in the wind. Panasonic’s Geometric Adjustment (4-Corner Adjustment) maintained high image quality while allowing stacked image alignment. And strong support from Panasonic’s sales and engineering team also maximized the PT-DZ21K performance to ensure success. An innovatively new performance took the entertainment capital of the world by storm. 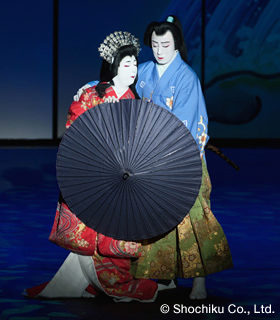 A ground-breaking production of a Special Kabuki show premiered. 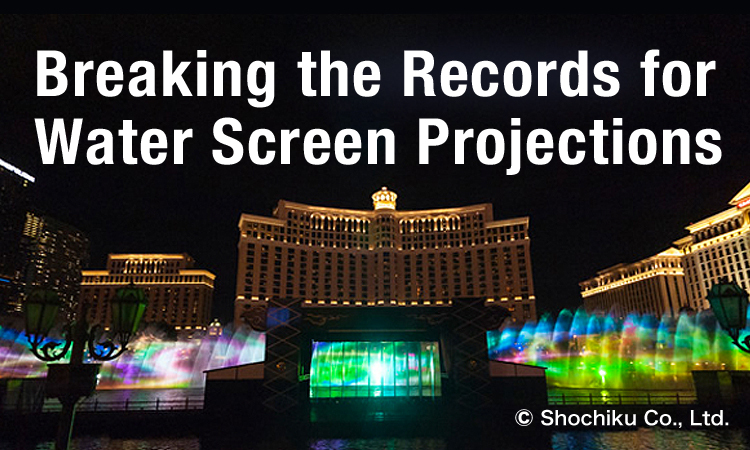 Featuring larger-than-life animation and water choreography, Panasonic projectors brought to life one of the world's largest water screen projections. 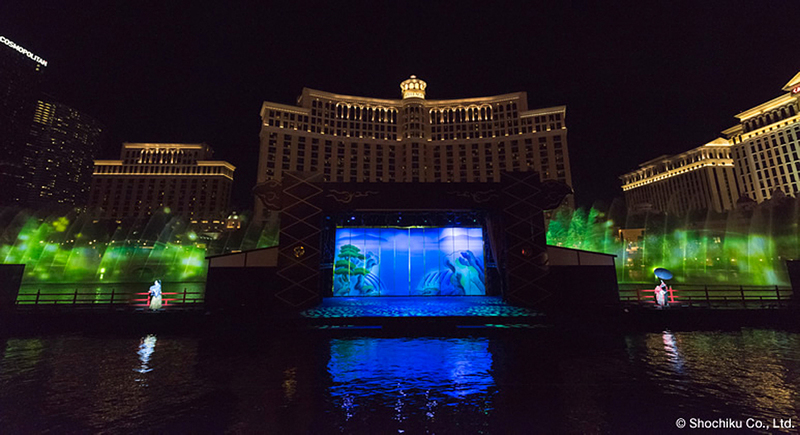 Featuring larger-than-life animation and water choreography, Panasonic projectors brought to life one of the world's largest water screen projections. “It’s very stereoscopic and colorful, and to tell you the truth, I thought it could be used for various types of entertainment, and I was very excited. The potential is infinite. There is a wider variety of mediums of expression out there, so today we are able to create something that can truly take the world by surprise.” - Jay Sakomoto, President of SHOCHIKU Co., LTD.
“I think that’s one of the most interesting things about the technical aspects of the show was the way in which the teams were able to push the envelope on those and certainly the projections on the water were spectacular, and it was very exciting to watch. 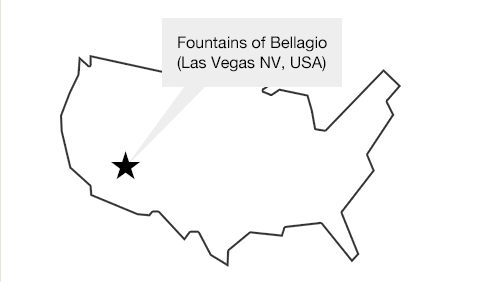 It’s clearly one of the most ambitious things that’s been done on Bellagio, and certainly it may give some in our company appetite to do more with the fountains in this kind of area.” said Ed Bowers, Representative Officer and CEO of MGM RESORTS JAPAN, LLC. Panasonic Corporation was sponsoring and provided technical support to the Japan KABUKI Festival in Las Vegas 2016. Panasonic hopes to highlight a new approach to performing and enjoying Kabuki by enlivening the performance of the art form with state-of-the-art technology to make it more engaging and accessible to contemporary entertainment seekers.